Snapchat's lenses are one of the most popular things about the app. They allow you to play around with different animations to change your face and that can be pretty fun. So it was no surprise when MSQRD - or Masquerade - came on the scene. The app was essentially just the Snapchat lenses only the options are there every day and they're always adding more. From giving yourself anime eyes or funky glasses to turning yourself into Ironman or Leonardo DiCaprio, you can do it all. This week Facebook have announced that they're acquiring the app through a video posted by Mark Zuckerburg on Facebook using the app whilst Masquerade posted a blog entry on their website. For Masquerade this proves that they've hit their peak and that they're providing a good service but for Facebook it means so much more. A few years ago Facebook tried to buy Snapchat. The app was clearly the next big thing and they wanted in but they were turned down. It seemed to be a smart move for Snapchat who are now making more money than they were back then and on their own. However they're still using technology that Facebook want and Masquerade also have and that's the facial recognition that both apps use. It can be assumed that for now Facebook will be using some of those filters in the Messenger app or for something similar. This is probably an attempt to attract a younger user base but it seems unlikely to work when there are still separate apps to use those filters on. Facebook had to do something though and that technology could be used for something more useful in the future. The original app is still going be available in both in the iOS and Google Play stores which is a good thing considering the app was only released on Android this month and users don't even have access to the full range of filters yet. You can easily share the videos and pictures on social media already but expect them to become a little more Facebook and Instagram related in the future. The app is still growing in popularity and Facebook buying it may encourage more and more people to use it, though they will likely be older than Snapchat’s user base. Even before this procurement was announced people were claiming that their parents used this app. It’s totally free at the moment with no advertisements or anything, now it's owned by Facebook that could change in the future but it doesn't seem as if that will be necessary for such a small app. 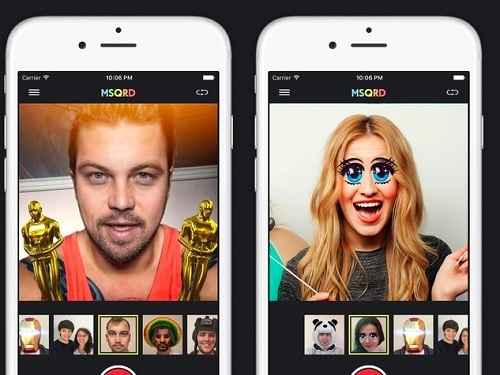 We have to wait and see whether buying MSQRD was a smart idea or whether it's going to go downhill like Facebook's previous two attempts to copy Snapchat have.